Here is just one of the vital projects into Bertie’s condition. It is being undertaken by Prof. Volker Straub at Newcastle (who diagnosed Bertie in 2014). This research is funded by the Family Funds for Muscular Dystrophy UK (MDUK). We are very proud to be making a difference. All our MDUK fundraising goes straight into their Ullrich Research Fund. Even JustGiving fees used to collect donations are paid centrally by MDUK and so every single penny we raise for MDUK goes into research! EVERY PENNY. You can help us fund projects like this by joining our Bertie’s Buccaneers ‘Team Bertie’ and signing up for an MDUK-sponsored event or by creating your own. This is our fight for Bertie and it is also our family’s legacy. It’s our way of saying we didn’t just give up. Carpe Diem! You might also like our earlier blog post on how your donation helps. An improved and expanded registry for people living with collagen VI-related conditions worldwide. Registries are databases that contain information about individuals affected by a particular condition. With permission, researchers and companies can access this information and identify patients that could take part in a study or clinical trial. As collagen VI-related conditions are very rare, recruitment for trials can be extremely challenging. This project will help to address this by improving European recruitment to the existing North American registry and expanding the registry to collect clinically verified information for collagen VI-related conditions. To carry out a clinical trial, researchers need to understand how conditions progress and have measures to monitor this progression. These measures are referred to as outcome measures, and are necessary to determine whether a drug or intervention is having an effect on a patient. This facilitate the development of imaging techniques such as Magnetic Resonance Imaging (MRI) as outcome measures for monitoring collagen VI-related conditions by finding a solution to collect and store MRI data with corresponding clinical information. A bio-bank is a collection of biological (usually patient) samples for use in research. This project will help to increase bio-banking by asking patients on the new global registry to donate blood and skin samples. These will be stored at the Newcastle Neuromuscular Biobank and will be accessible to international researchers investigating collagen VI-related conditions. Although new treatments are being developed for collagen VI-related conditions, the translational environment to get these from the lab to patients is currently weak. This project will help to address this by developing resources that are important for research and clinical trials. How will the outcomes of this research benefit people with collagen VI-related conditions? 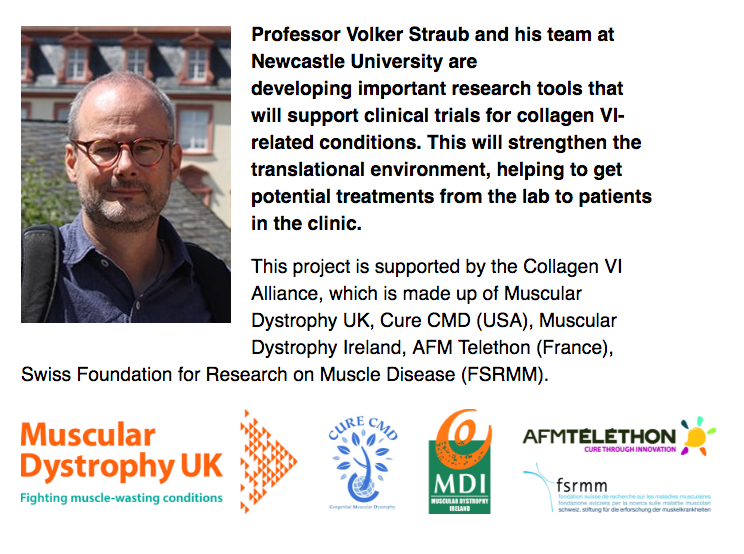 This project will help to accelerate translational research and clinical trials for people with collagen VI-related conditions. Establishing a global registry will make it easier for companies to conduct trials in Europe and beyond, and could potentially increase the number of clinical trials taking place in the UK and other European countries. Facilitating the validation of MRI as an outcome measure could also have great value for patients as it is non-invasive and may reduce the need for muscle biopsies in future research and clinical practice. This project will facilitate the validation of MRI as an accurate method for examining muscle health. This knowledge could potentially be transferable to other neuromuscular conditions. This project will also attempt to integrate an existing patient faced registry with additional databases containing clinically verified data. This model for registry development could be applied to registries for other neuromuscular conditions. Posted in Donations, Researching a cure and tagged Bertie's Buccaneers, Muscular Dystrophy UK, Volker Straub.